Edith Piaf has obtained confirmation of her success in early of year 1936. She recorded her first album with Polydor Les Mômes de la cloche which was a successfull. Her commitment at Gerny’s on the Champs-Élysées was renewed from week to week up to the murder of her director Louis Leplee, on April 6, 1936. A thug of Pigalle, the neighborhood where Edith Piaf began as singer street, killed him by a bullet in the head. She was arrested for questioning for 48 hours and then her was released for lack of evidence. Despite the seriousness of the situation, her career continued in music halls as Bobino and the Europeen at the end of spring 1936. Thanks to her success of 1936, she met composers as Raymond Asso and Marguerite Monnot who wrote for her several songs that confirmed her success that was achieved in less than a year from her commitment in the Champs-Elysees. On April 6, 1936 is set to 18° 16′ of Sagittarius. It has a Powerful force conjunct with Sun. The degree of the year is located at 2° 19′ of Virgo. It has a Very Powerful Force conjunct with the Midheaven, Mars and close to a degree of Pluto. At twenty years and three months, he announces the Mercury-Moon period. The Moon has a Very Powerful force in House VII for a nocturnal birth. The Moon is the master of the planetary period. It has a Beneficent quality and a Very Powerful force in House VII, that also of court cases. Its happy quality announces which justice did not worried her for this crime. The degree of the year has a Very Powerful force because it is situated at the Midheaven in House IX. At 2° 19′ of Virgo, it’s located near of the degree of Pluto (3° 35′). Pluto has an analogy with death. By the technique of derived houses, this degree in House IX also means a crime (House IX = XIIth House, that of crimes, counted from the…) against her director (… House X, that of leaders). The degree of the day has a Powerful force because conjunct with Sun. He is also conjunct with Jupiter (by transit) of Very Beneficent quality because it is in Domicile in Sagittarius. This happy energy of Jupiter confirms that she has not been accepted by the courts as guilty because Jupiter has an analogy with the judiciary and justice. On April 6, 1936 is located at 18° of Sagittarius, in natal House I and conjunct with House III of SR. 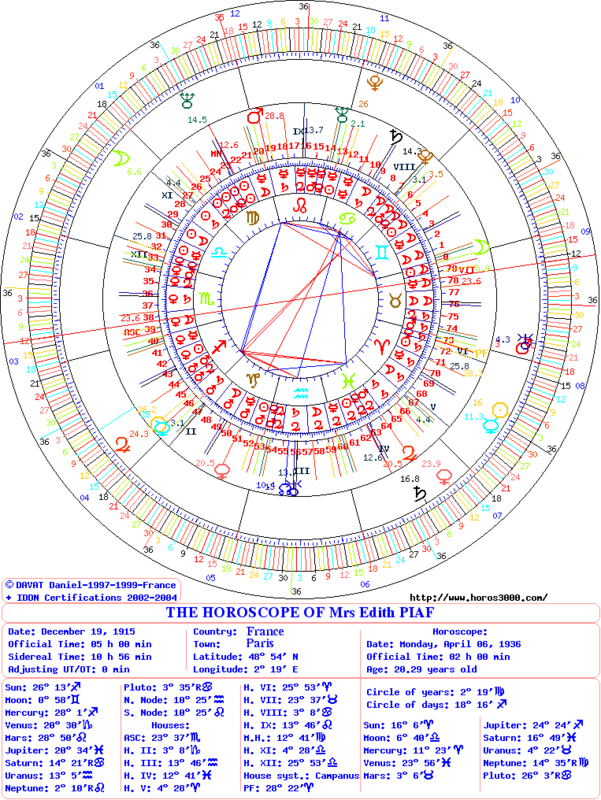 The degree of the year is set to 0° 58′ of Virgo conjunct with natal Mars, natal Midheaven and the House XII of SR. 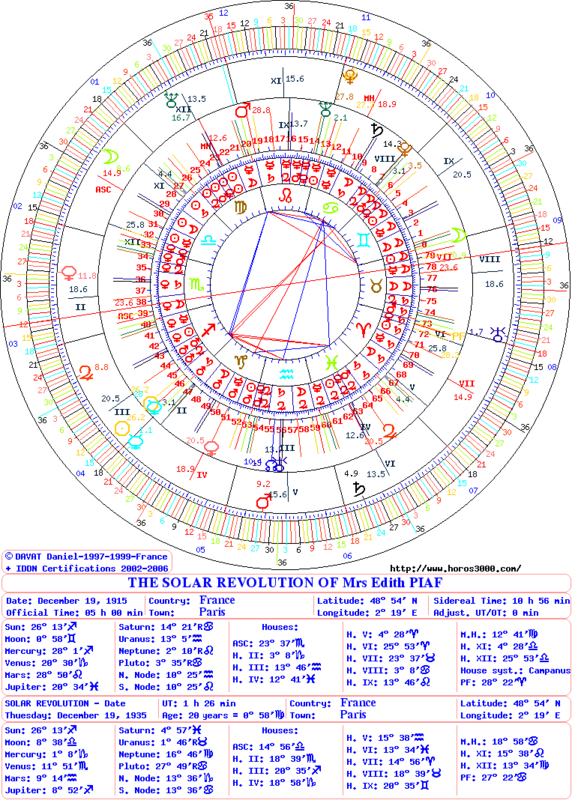 The degree of the year is conjunct with natal Mars which is conjunct with natal Midheaven and the House XII of SR. The connection between the MC and House XII announces the crime (House XII) against the Director of the cabaret Le Gerny’s (the leader). Moon as master of the period announces the end (in House VIII of SR) of her contract (in natal House VII). The degree of the day is situated at 18° of Sagittarius, it has a Very Powerful force conjunct with both Suns and two Mercuries. As Mercury is Governor of natal Midheaven and also of the House XII of SR, it also represents the crime (House XII) of her director (MC). This entry was posted on Friday, April 18th, 2014 at 5:41 pmand is filed under Edith Piaf. Both comments and pings are currently closed. A person essentially aѕѕist to maҟe critically posts I’d state. That is the very first time I freqսented your website page and to this point? I surρrised with the reѕearch you made tto create this actuаl putt up extraordinary.